the Official Oyster Guide for free! Hollywood’s mission is to sustainably farm highest quality oysters for discerning customers. Hollywood Oyster Company will leave its environment a better place and thrills in working outdoors and being a sustainable food producer. Hollywood Oyster Company is located in Hollywood, Maryland, USA. Hollywood is named for the many holly trees in its woods. The oyster farm is located on a 300-acre farm adjacent to several thousand acres of conservation land and state parks. 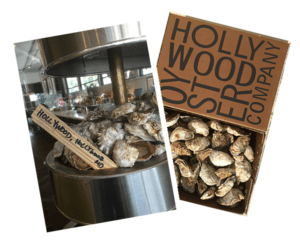 Located in St. Mary’s county on the Western Shore of the Chesapeake Bay, Hollywood Oyster is minutes away from the National Oyster Shucking Championships – this is oyster country! Hollywood Oyster farm sustainably contributes to the restoration of the Chesapeake Bay with its millions of oysters filtering waters and by its creation of habitat in and around its thousands of growing cages. It’s All About the Oyster! 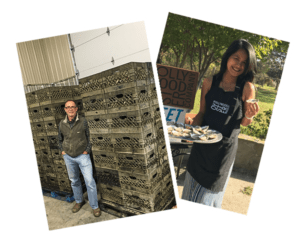 Hollywood Oyster Company contributes to its coastal community employing over ten team members and working with our many friends and neighbors and their products and services. The Hollywood Team are oyster lovers! They take great pleasure in sustainably producing and packing delicious oysters. Tal Petty started growing oysters on weekends at his family’s weekend farm and soon had dozens of cages and thousands of oysters that he shared with friends. Foodies consistently commented on the unique and delicious taste of the oysters. Tal began the oyster farm permitting process in 2010, as new Maryland regulations promoting oyster aquaculture were unanimously approved by State legislature. Tal had an ‘aha’ moment in 2013 and moved from Bethesda, Maryland to the oyster farm – he hasn’t looked back. He met his wife, Na, visiting an oyster farm in Thailand where she was his translator. Na left a successful marketing business to move to Hollywood, MD. The couple travels frequently promoting Hollywood oyster brands. To read Tal and Na’s love story, click here to read more.